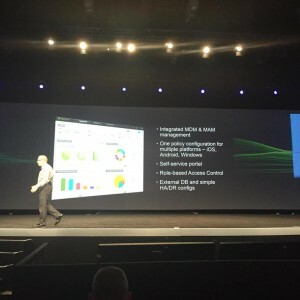 This year the weeks leading up to Citrix Synergy have already been filled with some great news on new releases and/or tech previews for partners. Building up the expectations for the Citrix Synergy keynote for sure. And today the keynote was packed with announcements that lived up to my expectations. Not just a great start of the keynote, but a very important opening statement from Citrix at the start of the keynote. Letting us all know that they have heard us and realize our love for Citrix XenApp! Extending the lifecycle for XenApp 6.5 is an important step, giving a lot of customers time to let application lifecycles catch up with the fast pace of infrastructure development and innovations. Pushing back the End of Maintenance date till December 2017 shows that XenApp 6.5 is not just kept on life support, but development is still going strong by releasing a new Feature Pack for XenApp 6.5 as well. And with the introduction of StoreFront 3 and the new Receiver you’ll even be able to integrate multiple versions side-by-side! How’s that for some love? 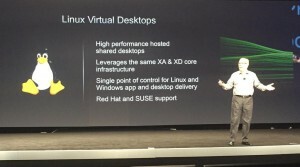 And there’s even more love for XenDesktop/XenApp 7.x as well. Feature Pack 2 will be released soon (June), offering Lync 2013 on Mac optimization, Touch ID support on iOS (adding new authentication methods to the mix), HDX with Framehawk to enhance performance for high latency connections as well and a Linux VDA to publish Linux apps and desktops as well. Not only did Citrix extend the published application portfolio with Linux applications, but a lot has happened for XenMobile as well. The new XenMobile 10 version has integrated both MDM and MAM into a single solution (with a very improved interface) to even better support the MDX technologies that allows you to securely offer business apps to mobile devices. The XenMobile team has also decided to create separate cycles for the XenMobile Server and WorxApps/MDX Toolkit releases, which allows them to update de MDX enabled apps more frequently. Introducing even more MDX enabled apps to the portfolio. Extending the existing WorxApp portfolio to a total of nine MDX enabled apps. Wouldn’t it be great if you could use standardized Infrastructure components for your Citrix solutions that are set up with a few clicks, managed and lways up-to-date so you can concentrate on the customizations and personal settings that you want to implement for your published apps and data? Being able to use a cloud service for those standard components and easily connect them to your personalized (on-prem) SaaS solutions? Now you can just do that with the introduction of Citrix Workspace Cloud, a managed Cloud services by Citrix that offers you a way to easily match those standardized Citrix components, like the XenDesktop/App Delivery Controllers, Database and StoreFront with your own personalized desktop services (Hosted Shared, VDI) that can be run from your own private or public cloud. There were so many announcements made during the keynote and I do want to address them all, but that would make this post a couple of pages long. So in no way are these announcements any less exciting! Citrix Melio is Now Available!